Dates of birth and death unknown. Disciple of Sawamura Sôjûrô I, his first-recorded performance happened in the 11th lunar month of 1727 in Edo at the Moritaza, where he played under the name of Sawamura Sôgorô the tachiyaku role of Hiraka no Saburô in the kaomise drama "Hônen Taiheiki". He tourred in 1734 in Nagoya and Ise along with Fujioka Daikichi, Arashi Sanjûrô I, Ogino Yaegiri I, Tamiya Shirogorô, Sakakiyama Fujisaburô, Tatsuoka Someemon, Sagawa Bunzô II, Fukuda Dan'emon, Ôtori Michiemon and Matsushima Hyôtarô. He settled in Kyôto in Fall, playing the roles of Kajiwara Heizô and Kobunji in the drama "Nasu no Yoichi Saikai Suzuri", which was produced at Kameya Kumenojô's theater by Sakakiyama Shirotarô. He also played in the 11th lunar month of 1735 at Miyako Mandayû's theater the role of Imagawa Yoshimoto in the kaomise drama "Bankoku Ôshimadai", which was produced by Nakamura Tomijûrô I. He settled in Ôsaka in Fall 1737 and played at the Kado no Shibai the role of Takigorô in the kaomise drama "Iwatogura Kogane Masugata". He played in the 11th lunar month of 1744 at the Kado no Shibai in the kaomise drama "Yamazaki Yojibê Imayô Sugata", which was produced by Arashi Sanjûrô II. This was his last-recorded stage performance. 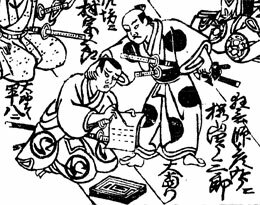 His ranking in the 1745 Ôsaka hyôbanki, katakiyaku section, was jô-jô-(shiro)hankichi (superior - superior - (white) half excellent). We don't know what happened to him afterwards. Born in Tôkyô the 30th of October 1909. He started his career in 1918 as a disciple of Bandô Katarô (a disciple of Ichimura Uzaemon XV), who gave him the name of Bandô Katô in 1920. He became a disciple of Morita Kan'ya XIII and received the name of Bandô Takizô in January 1928. He became nadai and took the name of Bandô Yajibê in April 1942 at the Tôkyô Gekijô. He became a disciple of Sawamura Sôjûrô VII in 1943 and received the name of Sawamura Gengorô. He took the name of Sawamura Sôgorô II in September 1953 at the Kabukiza, playing the role of Ichisuke in the drama "Kiwametsuki Banzui Chôbê". He finally became a disciple of Morita Kan'ya XIV and took the name of Bandô Yagorô II in January 1961 at the Kabukiza, playing the roles of Ishihara Shingo, the tedai Sahei, the wakatô Tomohei and the taiko mochi Sakuragawa Ryûhei in the dramas "Kinkakuji", "Shiranami Gonin Otoko", "Keya-mura" and "Yoshiwara Gitsune". He appeared on stage for the last time in October 1993, in Tôkyô at the Kabukiza, where he played the role of the yanushi Jinpachi in the drama "Bunshichi Mottoi". He died the 8th of February 1999. This important supporting actor served three generations of masters: Morita Kan'ya XIII, his adopted son Morita Kan'ya XIV and finally Bandô Tamasaburô V. He was outstanding in bantô or tedai roles in sewamono dramas, like the bantô Chôkurô in "Hôkaibô" or Tôhachi in "Kirare Yosa".